All of the tarpies* were probably so pissed with the mass amounts of rain that smacked down on them today as they sat in the fields at Folk Fest waiting to hear their favorite bands play. I didn't hit up the festival until later in the evening (Yes, I have a day job. No, it is not anything near as exciting as you think) and I was thankful that was the case. While I stood there watching the crowds, my mind was blown by the fact that most of them had been toughing it out the entire day and I just arrived and was already uncomfortably cold and wet. It reminded me of every single camping experience I had as a child. I grew up on the West Coast...who the hell takes their family camping on the 'wet coast'? My parents, that's who. Needless to say I was not unfamiliar with this rainy, camping like feel - and I was not feelin it. Thankfully there were a few bands that took my mind of my chilled-to-the-bone body temperature. 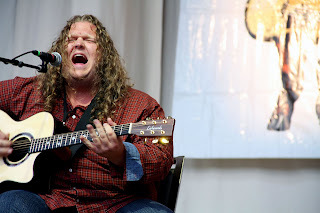 Matt Andersen was the first. A blues type dude from Bairdsville, NB. I had heard of him previously, but I was not all that familiar with his work. But dang, the man can sing. It was just Matt and his guitar on stage and I was riveted...until I saw a kid in front of me shivering in the rain, soaking wet wearing a backpack that was opened enough that I could see his umbrella...WHO ARE THESE PEOPLE? Back to Matt. He chatted with the audience and said that it is always really interesting when your ex figures out that a song you wrote was about them, but not in a good way. I always wondered how that wold go down. He described it as, she calls him and leaves a message saying...'number 5 sounds oddly familiar' and he thinks 'wait til you hear 7 and 13' Ha. Matt has this long crazy curly hair which I totally do not approve of. He is also a giant man, but both of those things work for him. He looks very unassuming, not like a rock star at all and then he opens his mouth and those who never heard of him probably had to pick their jaws up off the floor. I love that kind of stuff. It is way better than the completely decked out rocker with half an ounce of talent. Between Matt and the next band I spent most of my time drying off and attempting to stay warm while watching my breath come out of my mouth. It's not an easy task...staying 'positive' (I use that loosely, as I am not positive in general) while freezing and you feel the life being sucked out of you. Thankfully I was able to stay in the game to see one of my festival highlights: Patrick Watson. The man is hilarious. Earlier in the day he played a set in which he smoked the entire time. At this show, which was on the main stage, he only had a cigarette in his mouth until right before he started. I am not sure how he managed to last, but he did. Props. 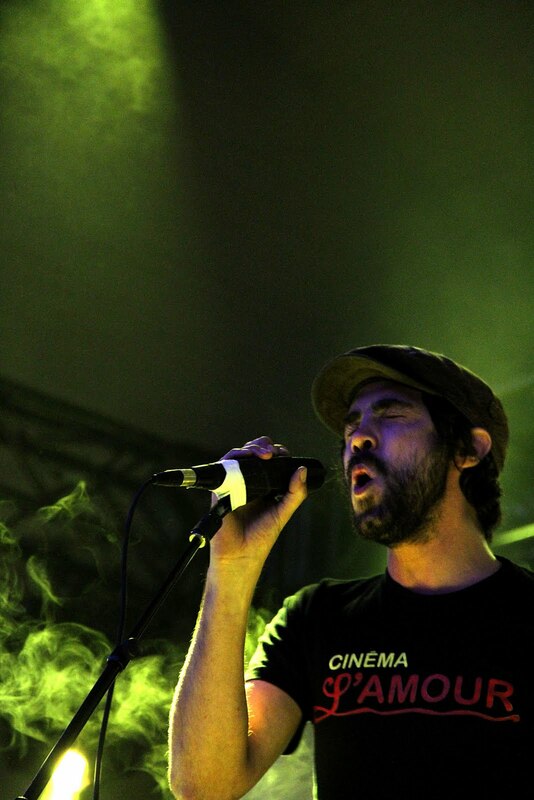 If you know one song by Patrick Watson it is probably The Great Escape which has been used in multiple TV shows and films. It is pretty rad, but his other stuff is just as good. You should definitely give it a whirl. I absolutely loved when he played the piano with his legs crossed. I may be the only one who noticed and/or thought it was divine, but it was. I stayed until the end of Pat's set. The crowd loved it. That is a wrap for day 2 of the festival. I have been home for an hour or so now and I am still cold. Damn you straight to hell Mother Nature. You better smarten up or else...I'll throw a water bottle in the trash. I would lose the 5 cents just to piss you off. Hmph. *Tarpies are the people who camp outside of the Folk Festival and are the first people in when the gates open the next day. They plant themselves as close to the stage as possible and use tarps to claim their space. I've never been to a folk festival before. We are currently getting rain ... the first in a long time.